Many of you will already know the extremely sad news that James passed away at UCH on 12 October. He was finally diagnosed with liver & bowel cancer in February 2015, symptoms that had begun to show that previous summer particularly while he was turning out for the IVs during those longer timed matches. 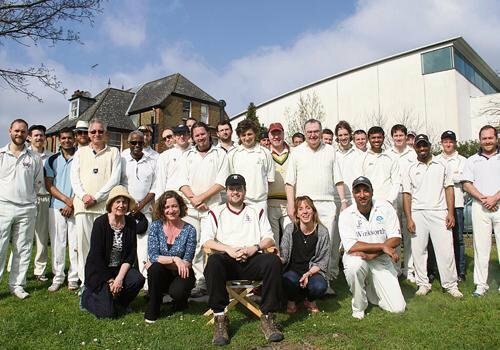 James was active in Islington cricket since he left City of London School & was always keen to play & before he turned out for the Midd he was playing for Kings' College London CC, London School of Economics CC, Old Citizens, Law Society, Pacific, the JGA, & his final game was for Highgate Taverners at Wray against Pacific exactly a year before he died. James was a key figure in Luke Hollman’s early development & would often go to the nets to bowl to him or even in winter under the floodlights of Whittington Park while the football teams changed ends at half time! It was inevitable that James then would follow Luke to North Midd & to follow his dream to play in the same XI. However, James was a more than useful seamer & was immediately drafted into the 4s while Luke established himself in the 5s. Frustratingly James had more chance of going up into the 3s while Luke was enjoying a prominent role with bat & ball in the 5s. As Ethan Bamber recently said, the 5s were a perfect nurturing & developing ground so there was no rush to push him on & up. Eventually & against Hornsey 3s they finally were selected in the same XI but it was for the briefest of times as Luke broke a finger at mid-on trying to catch a cross batted bludgeoning shot off James who insisted on taking the blame for having bowled too short! To those of you who played with or met James, you’ll know that was typical. He was thoughtful & caring & will be sorely missed. James was an ardent believer that this great game was really just a batsmen’s game. He was triggered early by the cruellest of decisions & had so much still to give but he took it with the dignity it didn’t deserve in that last trudge back to the Pavilion. James’ funeral will take place at 12 noon on Friday 2 November at Golders Green Crematorium 62 Hoop Lane, Golders Green, London, NW11 7NL . His wake will follow at 1.30pm at Lauderdale House, Waterlow Park, Highgate Hill, London N6 5HG.